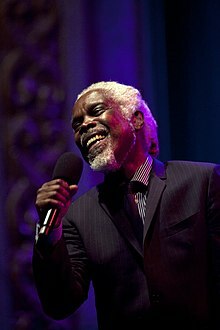 Billy Ocean (born Leslie Sebastian Charles; 21 January 1950) is a songwriter, recording artist and musician. He was born in Fyzabad, Trinidad to Grenadan parents. He has many hit singles. Most were put out in the 1980s. He was the most popular British-based R&B singer-songwriter of the early to mid-1980s. On 29 July 2011, Ocean became a Companion of the Liverpool Institute for Performing Arts. His title was presented by Sir Paul McCartney. ↑ Reuters. "Tinie Tempah, JLS Big Winners At MOBO Awards". Billboard.com. Retrieved October 21, 2010. ↑ "UK Charts > Billy Ocean". Official Charts Company. Retrieved 2012-01-21. For Australian charts before June 1988: "Australian Charts > Billy Ocean". australian-charts.com Hung Medien. Retrieved 2012-01-21. For Australian charts after June 1988: David Kent (1993). Australian Charts Book 1970—1992. Australian Chart Book Pty Ltd, Turramurra, N.S.W. ISBN 0-646-11917-6. ↑ "CAN Charts > Billy Ocean". RPM. Retrieved 2012-01-21. ↑ Pennanen, Timo (2006). Sisältää hitin - levyt ja esittäjät Suomen musiikkilistoilla vuodesta 1972 (1st ed.). Helsinki: Kustannusosakeyhtiö Otava. p. 227. ISBN 978-951-1-21053-5. ↑ "Charts.de - Albums - Billy Ocean" (in German). charts.de Media Control. Retrieved 2012-02-24. ↑ "Dutch Charts > Billy Ocean" (in Dutch). dutchcharts.nl Hung Medien. Retrieved 2011-01-30. ↑ "NZ Charts > Billy Ocean". charts.org.nz Hung Medien. Retrieved 2012-01-21. ↑ "Swedish Charts > Billy Ocean". swedishcharts.com Hung Medien. Retrieved 2012-01-21. ↑ "Swiss Charts > Billy Ocean" (in German). swisscharts.com Hung Medien. Retrieved 2012-01-21. Chart positions before 1985: "AllMusic > Billboard 200 > Billy Ocean". Rovi. Retrieved 2012-01-21. Chart positions since 1985: "Billboard > Billboard 200 > Billy Ocean". Billboard. Retrieved 2012-01-21. ↑ 15.0 15.1 15.2 "BPI Certified Awards". British Phonographic Industry. Retrieved 2012-01-21. ↑ 16.0 16.1 16.2 "CAN Certifications > Billy Ocean". Music Canada. Retrieved 2011-12-18. ↑ 17.0 17.1 17.2 "US Certifications > Billy Ocean". Recording Industry Association of America. Retrieved 2012-01-21. This page was last changed on 30 August 2017, at 22:01.